This may be the film for which Robert Bresson is best known and most appreciated. While it’s certainly not my personal favourite, one can’t deny its power, influence and effect. It is the story of Balthazar, a donkey who throughout its tumultuous lifetime observes the cruelty, tyranny, selfishness and ugliness of the human condition. It is abused by several of its owners, while others care for it and some treat it as a saint. Its first owner, Marie, is a woman who is, like Balthazar, mistreated and neglected by many. As a child, she hopes to grow up and marry her friend Jacques, but as she grows she realizes how much she doesn’t love him, and lets him walk away, a foolish mistake. Her family loses money and respect, and they are forced to sell Balthazar. He is sold to the wicked Gerard, one of the most chilling antagonists in film history, whose emotions toward both her and Balthazar are wicked, sinful ones of hatred and disrespect. The donkey and the girl encounter various hardships at the hands of Gerard (and some others). Balthazar’s tale is lit on fire by a frustrated Gerard. Soon after, he proceeds to inflict similar pain, though more emotional, on Marie, as he chases her into his car and feels her while she sits, squirming. Balthazar is certainly not human, but I think his intelligence rises over that of any other character in the film. While his physical form and tired mind limit him only to observe the chaos, greed and folly around him, he sees it with wise, knowing eyes, and wisely never tries to intervene. Though much of it is spent nonchalantly standing around and munching grass, Balthazar has an eventful life. At one delightfully comic but painfully brief moment he is selected as a circus attraction, but he is surprisingly not mistreated. He is trained to do maths tricks, and in one shot we see him as people are applauding him, and I dare say he is smiling. If this is so, it must be the only time in the film where things are this fortunate for him, but the moment doesn’t last. Certainly, Balthazar is an important figure in the tale, but it is not just his story. Very little of it (if anything at all) is told from his point of view, and the scenes in which he is featured is the viewer observing him, not observing what he sees. Bresson, as a filmmaker, remains distant, still and watching; not trying to intervene, simply recording and documenting. He doesn’t try and inspire us to feel emotion, he just shoots the scenes and lets emotion strike within the viewer whenever they feel it. The scenes of violence toward the donkey are not fuelled by hate or vicious emotion, they are just normality. The donkey suffers as we all suffer, and any moment of contentness is annoyingly brief, as it would be for the normal human being. It is not a spoiler to say Balthazar dies. We know its coming, and for the film to end ambiguously with him alive is cheating the viewer. Au Hasard Balthazar is about the lifetime of an average creature. One can relate it to a human lifetime easily. The film starts with his birth and ends with his death, and it is Bresson’s chronicle of the magnificent, beautiful yet painful existence that is life. Balthazar’s inevitable death might be one of the most poetic scenes I have ever viewed, as heartbreakingly saddening as it is lovingly reminding of the strength and endurance of humanity, and the eventuality of a painful existence that shatteringly reflects the eventful lifetimes we all face. Marie: Don’t you believe in anything? Marie: You’ll die like everyone else. After Au Hasard Balthazar came a slightly underrated film called Mouchette. 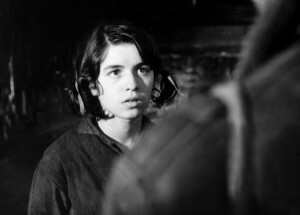 One of the more powerful and important films about teenage angst, insecurity and bullying, Mouchette, in typical Bresson fashion, deals with these themes indirectly and not dwelling on the bad things for too long. Mouchette is raised by her ignorant, sick mother and spiteful, glaring father. She has a tough time at school, and the people around her seem not to care for her at all. On a walk home from school, a boy flashes her and she runs off, not crying or afraid but typically annoyed, frustrated and tired. She throws rocks at girls she is jealous of, yet hides from them and avoids them all other times. One day, she stumbles into the woods and meets a poacher, Arsene, who attempts to use her to save himself from being arrested for murder. The events that ensue are dramatic, subtle, shocking and disastrous. Mouchette is definitely Bresson’s best film, and it has been praised by critics, though few people recognize it when Bresson is mentioned. Long-time Bresson admirer Jean-Luc Godard, formulated the trailer in which he affectionately called it ‘Christian and sadistic.’ The film’s bleak tale indeed is influenced by religion, but subtly, and the focus seems more to be on the absence of religion in Mouchette’s life. The awful and embarrassing events that befall her are tragic and tumultuous, and religion seems to have no other affect than being a terrifying force which laughs at her. As with Au Hasard Balthazar, there is one scene where everything is well, although thankfully that scene in Mouchette lasts longer. In this scene, she playfully and wordlessly toys with a young man on the bumper cars, but the encounter is cut short before even a single word can be spoken between them by Mouchette’s daunting father. And from this point, the entire film goes downhill for the girl. She is a strong-willed, independent young women but she is unable to resist the excitement of participating in Arsene’s wicked game, and even after he betrays her trust, she feels compelled to defend herself and unsure of what else to do. This all leads to the film’s startling conclusion, which I won’t spoil, and which happens distubingly quickly and leaves the viewer breathless. Mouchette had an impact on me which I struggle to put into words. I had to watch it twice before it struck me what I’d just seen. I have a nasty habit of watching movies again directly after finishing them the first time, and this was certainly one of those cases. 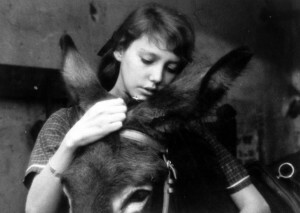 Mouchette‘s timeline, with particular emphasis on the ending, is difficult to comprehend the first time but we must realize that, like Au Hasard Balthazar, this is a story of an abused, hated, lonely being, who observes the world around them with neutral response; who accepts suffering but resents it, and who screams in silence for a world where the atrocities around them might be silenced, even if just for a second. Hi Tyler, this is a great review, I haven’t watched the movie so it was helpful to read this post. You’re right about Mouchette being underrated and relatively unknown, I personally only heard about it when I came across a new kind of website that was described as an artwork, called http://www.mouchette.org. The site plays off teenage angst, as it appears there is only one author of the site called “Mouchette” who claims she is 13 years old. However it seems there are multiple authors who contribute different pages, sometimes with audio of a girl sobbing or laughing…Check it out if you liked the movie, I’m interested to know what your thoughts are.